When Tinker, Tailor, Soldier, Spy first aired on the BBC as a seven-part mini-series in 1979, it created a sensation. The program starred Sir Alec Guinness, and was adapted from the celebrated Cold War-era novel of the same name. Guinness played George Smiley, a retired government agent, who is recalled to help track down a Soviet “mole” in the “Circus,” the nickname of the highest echelon of British intelligence. As always, Guinness’ performance was outstanding, and earned him the BAFTA (the British equivalent to the Emmys) Award for best actor that year. Another huge plus in the success of the series was the original material. John Le Carre’s 1974 novel was a classic of intricate storytelling, and he was heavily involved in the television adaptation as well. 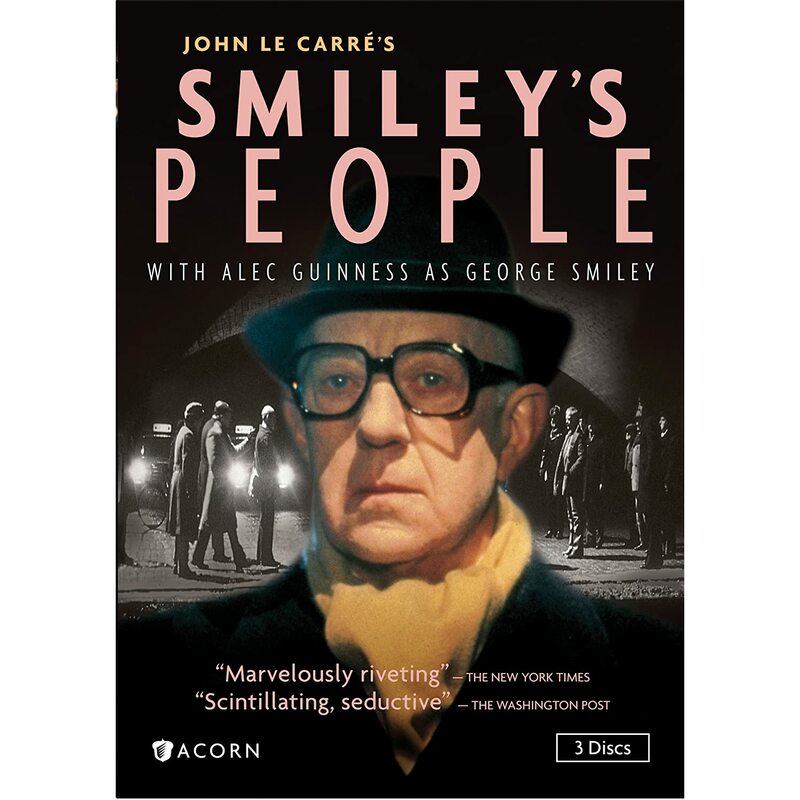 In 1979, Le Carre published the sequel to Tinker, Tailor, Soldier, Spy, titled Smiley’s People. It is hardly surprising that “the Beeb” decided to adapt Smiley’s People as a mini-series for the small screen in 1982. To coincide with the release of the Gary Oldman film version of Tinker, Tailor, Soldier, Spy -- the Acorn Company has released both mini-series as separate triple-DVD box sets. I must say that each set is mighty impressive. Tinker, Tailor, Soldier, Spy was previously reviewed here on TV Geek Army, and we felt Smiley’s People deserved to be highlighted as well. As a long-time Alec Guinness fan, I had heard about both of these series being among his finest roles, but unfortunately had never had the opportunity to view them until now. They really do live up to all the accolades they have earned over the years. One concern people often have with watching a program that was filmed 30 years ago is how “dated” it may look. Okay, there is no denying the fact that in today’s hi-def 3D age, Smiley’s People is not exactly Avatar in terms of its crisp look -- but that really does not matter. To me, it still “looks” great. The real point here is that this is a story that is absolutely fascinating, with so many plot twists and turns that it is hard to keep up with at times. I may be in the minority here, but I actually found Smiley’s People to be even more interesting than Tinker, Tailor (which I loved, by the way). Without completely detailing the plot, let me just say that in this final installment, we are offered an even deeper view of this extremely complex character. The Cold War intrigue is as fascinating as ever, with one double-cross after another - but it is how George Smiley seems to anticipate (and occasionally get tricked by) the various events that makes the show so intriguing. As for bonus material, Acorn’s modestly priced 3-DVD set includes a 20-minute interview with John le Carre, production notes, a glossary of the main characters and terms (which is helpful), cast filmographies and a le Carre biography. All in all, this is a wonderful package -- and Star Trek: The Next Generation fans take note -- Smiley’s People also features Patrick Stewart in a prominent role. The six episodes run 324 minutes, plus the 20 minute John Le Carre interview, and is highly recommended.